This is a 4-hour private tour with a taxi and guide. With your local driver and your licensed tour guide, your travels in the Tokyo area will not only be enriching, but will also be easy. Firstly, your guide will meet you at your hotel and take you to the chartered taxi at 9am. Departing from your hotel, the Tsukiji Fish Market is your first stop. This is the wholesale market for fish, fruits and vegetables. Being the most famous market in Tokyo, this is one of the most popular spots for both foreign tourists and Japanese alike. You can enjoy the vigorous atmosphere, and it is a good idea to have a breakfast or an early lunch, or at least a small bite. Then, your next stop will be Asakusa. 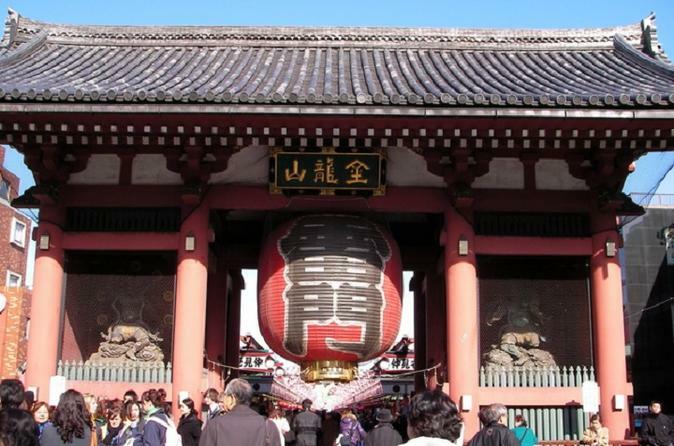 The big vermilion lantern on the Kaminarimon Gate welcomes you, and going under that, you will see lots of shops, mainly snacks and souvenirs, lining both sides of the long street, which leads to Asakusa Temple. Please enjoy the lively atmosphere of this entertainment district. The final stop is Meiji Jingu Shrine. Dedicated to Emperor Meiji (1852-1912) and Empress Shoken (1849-1914), this shrine is situated in a very large forested area in the central Tokyo. There are approximately 100,000 trees which were donated from various regions across Japan, making this place very tranquil. You can see some typical Shinto symbols such as Torii gates, votive picture tablets, written oracles, wine and sake barrels, etc. If you are lucky, you might have a chance to see happy couples in the traditional wedding kimono. After visiting the shrine, you will head back to the hotel at approximately 1:00pm.